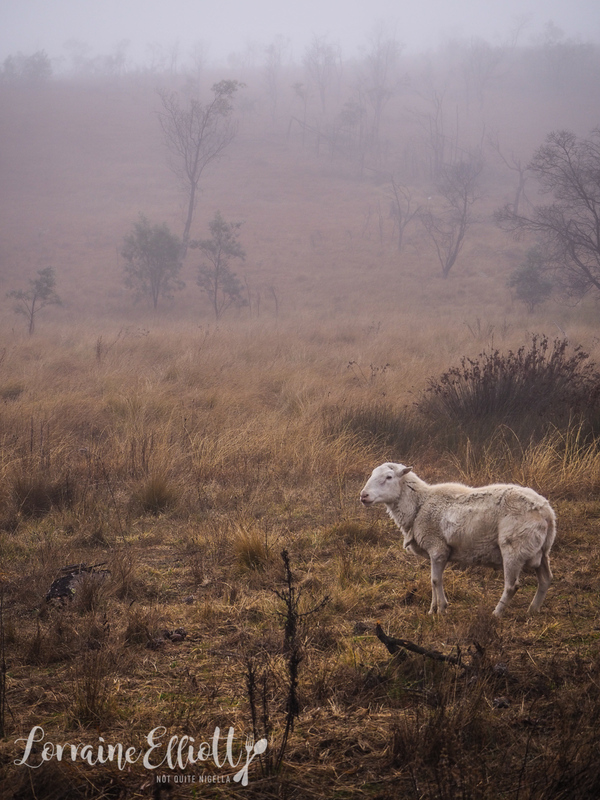 Headed towards regional NSW? 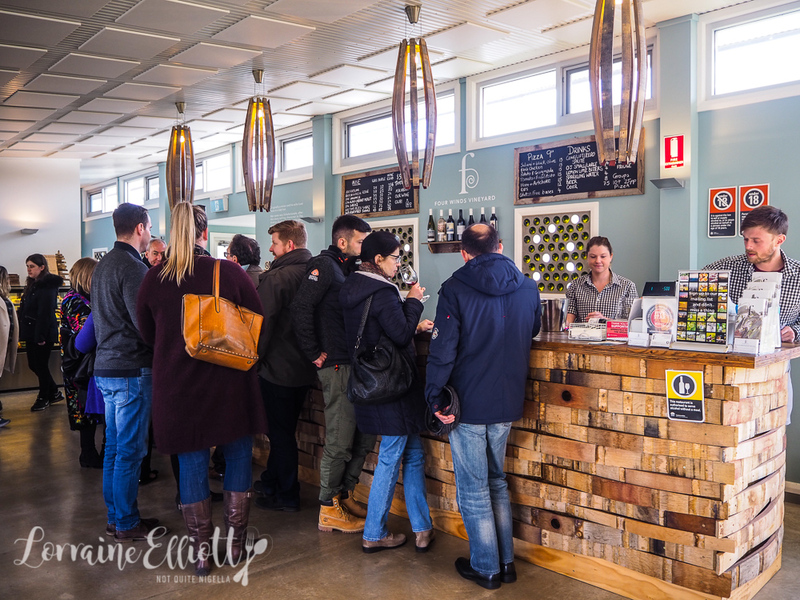 The areas of Yass, Murrumbateman and Gundaroo have no shortage of delicious eats and drinks and you will be spoilt for choice. There's also a micro revolution of female wine makers and chefs marking the territory's rise. 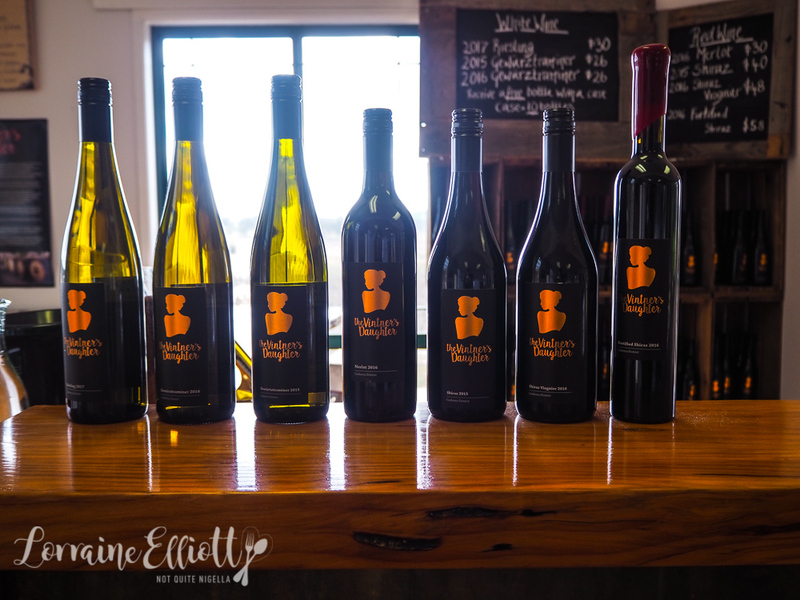 Stephanie Helm from The Vinter's Daughter has a couple of theories about why women wine makers in the region are a new thing. She explains that traditionally, the Canberra wine industry was created by older male scientists working at the CSIRO. One of these original wine makers was Stephanie's dad Ken Helm who lives about 10 minutes away. But now a new generation of women are coming through in Murrumbateman. She explains that it's a relatively new thing - when she completed her viticulture course there were just 4 women out of a group of 50. 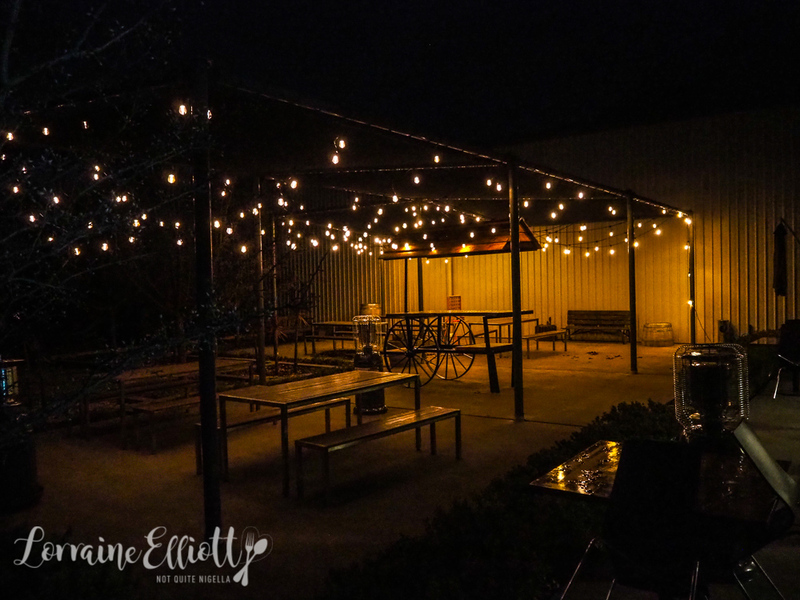 There certainly exists a boy's club but when you're a smaller winery and you're an owner operator you tend to set your own culture. She also believes that Canberrans are more progressive, "thinking people". Grace, her 20 month old daughter with husband Ben Osborne, walks around purposefully. Stephanie says that when she was Grace's age, she would start following her father around the winery. She made her first wine at 9 and won her first wine award at 11. She admits that during high school, she lost a bit of interest trying to fit in to the status quo but after completing an arts law degree at ANU and getting a desk job she decided that wine was where her heart lay. With a father known as the "father of Riesling" in the region, The Vintner's Daughter Riesling was always going to arouse curiosity. What does her father think of it? "He always says, 'That's better than mine' but I think he's being kind," she laughs. Her Riesling has since won many awards and her father is proud. Ben tends to the vines-all of the wine is made using estate grown grapes that were originally planted in 1978 and 1991. These older, deeper root systems helps them last through cold winter and hot summers. The 2016 merlot is one of their best sellers and it's easy to see why. They use an old French oak so not to over power the fruit and there are less tannins. There's also a lovely peppery Shiraz with 5% viognier. And to finish, there's a cork and hand dipped wax sealed fortified shiraz, deliciously sweet but not overpoweringly so. 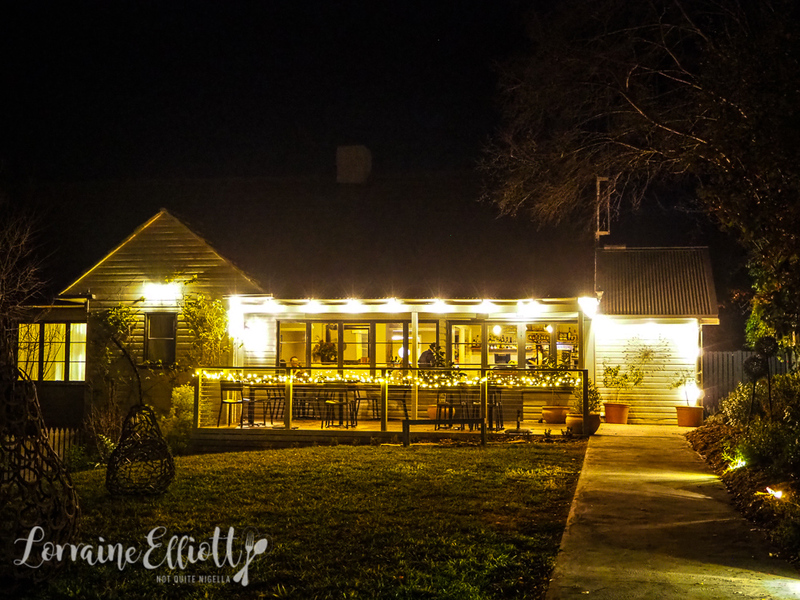 In the chilly cold of a Canberra region winter, the reception at Bella's at Tallagandra is always warm. 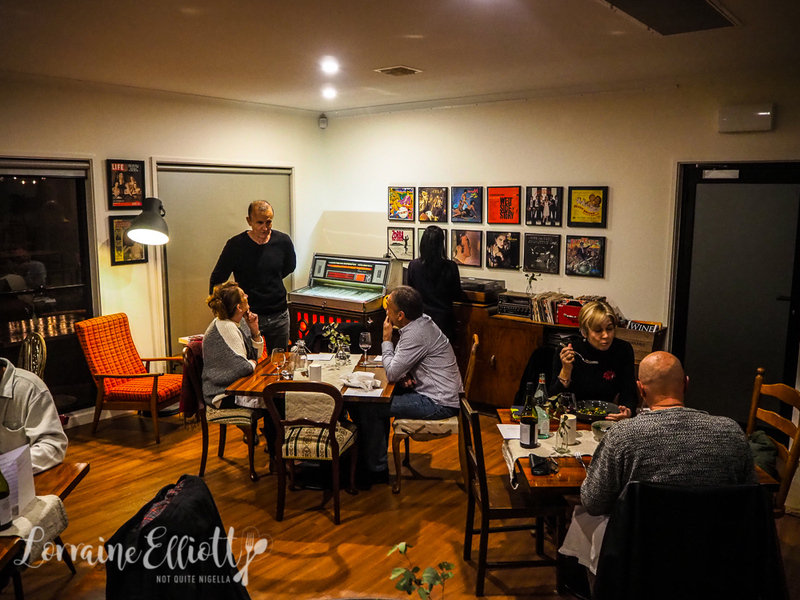 The restaurant and cellar door is a little like being in someone's house-that's courtesy of Tallangandra's owner David Faulks's jukebox and vinyl collection that plays everything from Boney M. to Madonna. David or his wife Mary McAvoy are usually on hand during dinner to talk wines. The food at Bella's is by newlyweds Bella Jakubiak and James Webster. 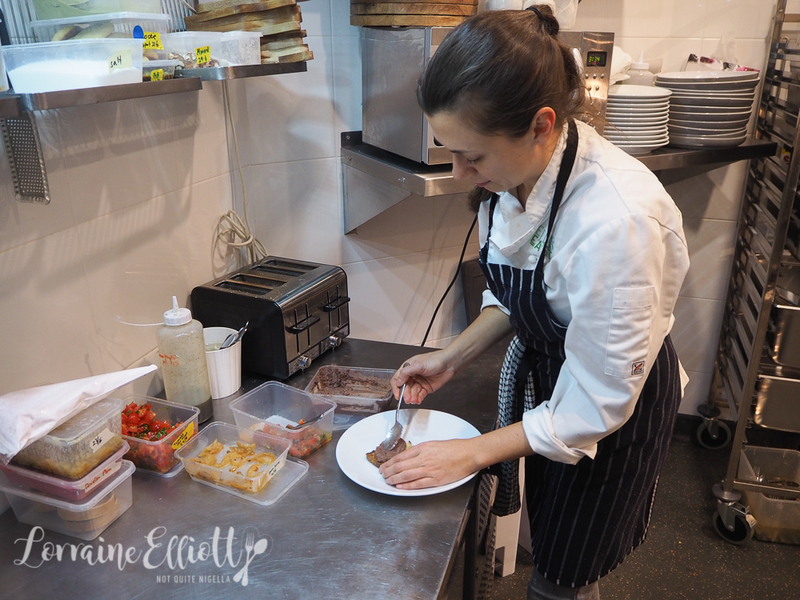 You may know Bella from My Kitchen Rules and Sammy and Bella's Kitchen Rescue. James is also a reality tv alum featuring on Married At First Sight. 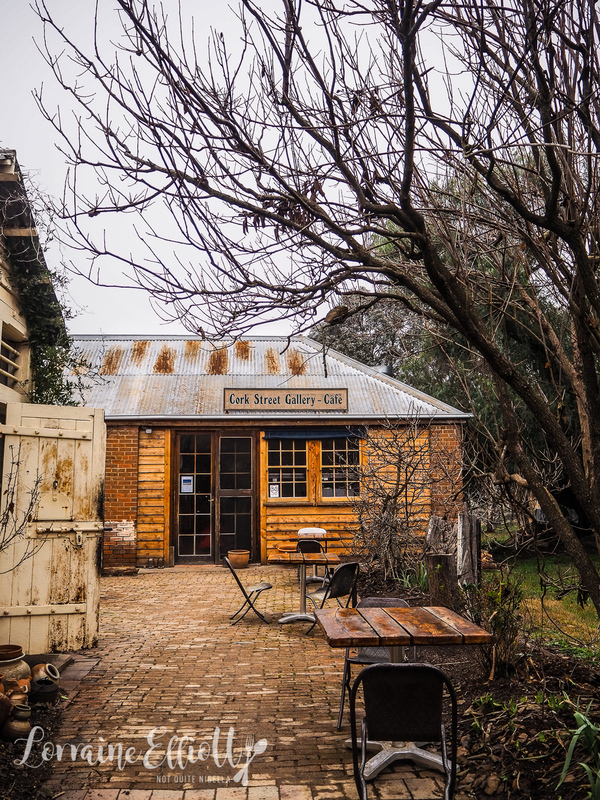 The down to earth couple have settled in Bungendore (James is from Canberra) and have been instantly embraced by the local community. Bella's vision for her restaurant is that it would like getting a hug i.e. warm and inviting. It has been open for 6 weeks at the time of our visit and with no advertising or press, locals flock here. The food here is home style and multicultural with a focus on sustainability and minimising waste. All kitchen scraps go to a neighbour to feed their chickens and the kitchen produces just half a bag of rubbish a week. Bottles are recycled and repurposed into candle jars. Bella also has a strong vegan clientele as she and James are flexitarians. 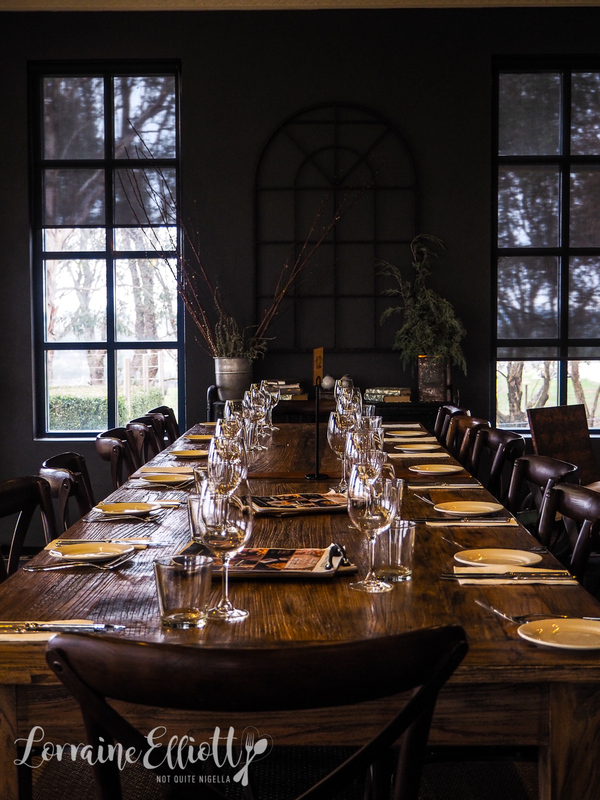 Two courses are $52 and three courses $63 and there are also additional appetisers and sides as well as a kids menu and all dishes come with a wine match suggestion. The first bite is a little taste that Bella has sent out to all tables. It's a silky smooth smoked salmon dip on soft, lightly toasted brioche bread. I had to order the pickled grape leaf hummus because I've never tried it before. It's a beauty and Bella tells us that it came to her in a dream. It's made with vine leaves, like the ones used in dolmades but cooked down with chickpeas until very soft. 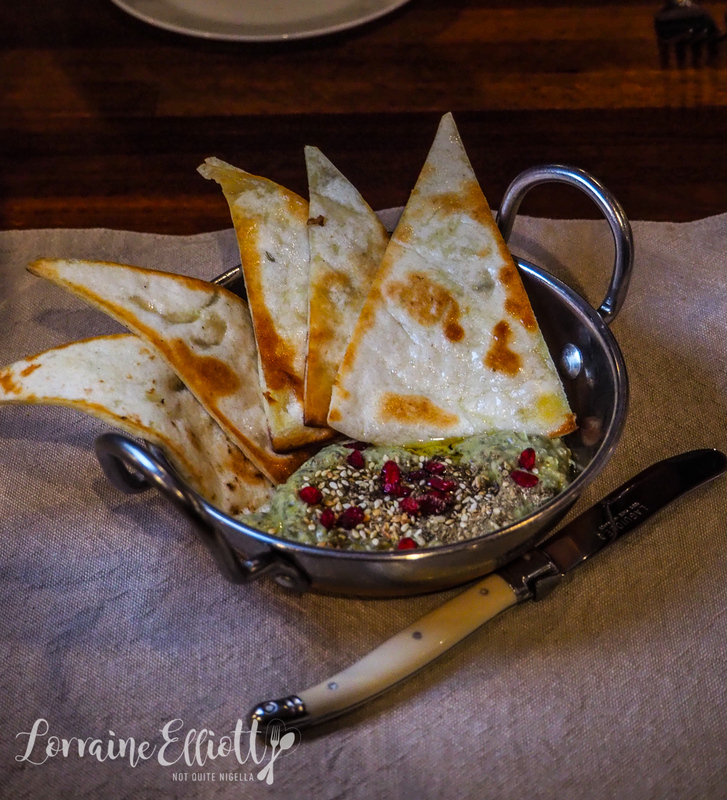 It is topped with za'atar and goji berries and are served with a warm triangles of flat bread brushed with oil. 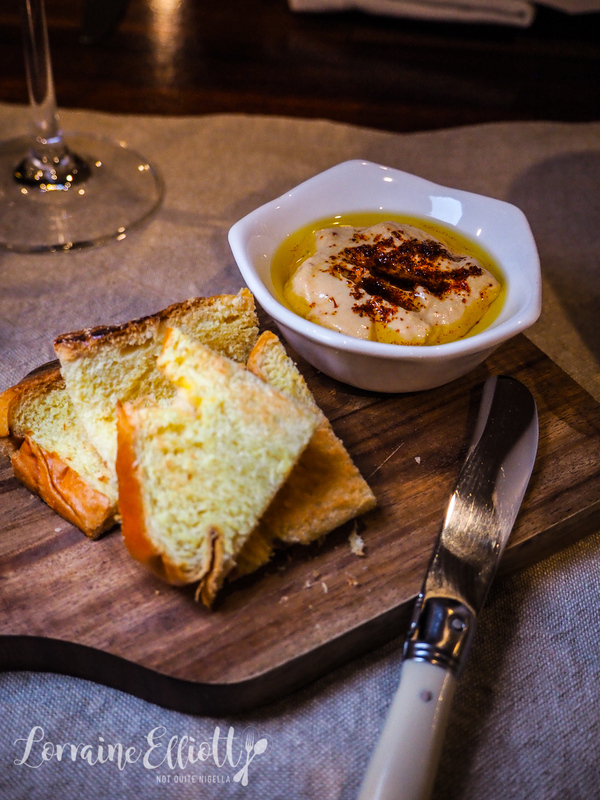 It's absolutely delicious, the saltiness of the vine leaves giving the hummus both texture and complexity. 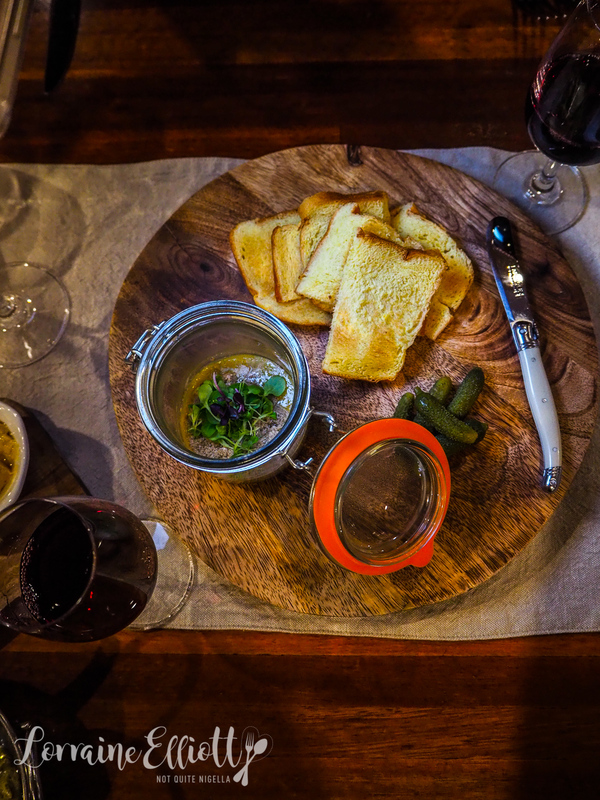 The country style pate comes out in a pot with a lightly chunky texture to it. It comes with brioche toasts and cornichons. David and James take turns chatting to customers-while James covers the food David talks wine and he introduces us to the different varietals of wine that they have - their Vermentino and Viognier in particular are favourites. 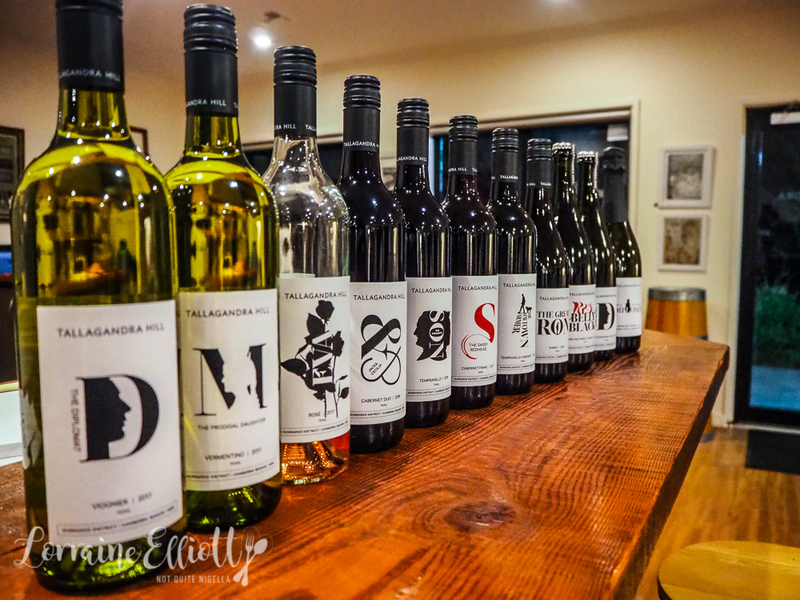 Many of the wines are named after family members and all have a story behind them, all detailed on the back of the labels. "What do you all want to hear?" asks David at the jukebox and people shout out requests. 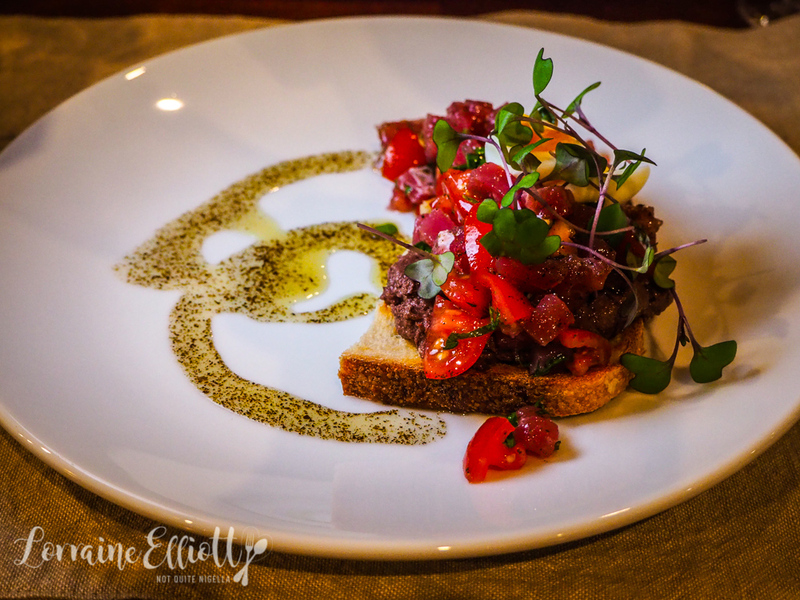 The bruschetta comes out and it's topped with an olive tapenade, finely chopped tuna tartare with a boiled quail's egg and a touch of lemon myrtle oil. Bella says that she loves to use native Australian produce where she can and the lemon myrtle is a nice addition. 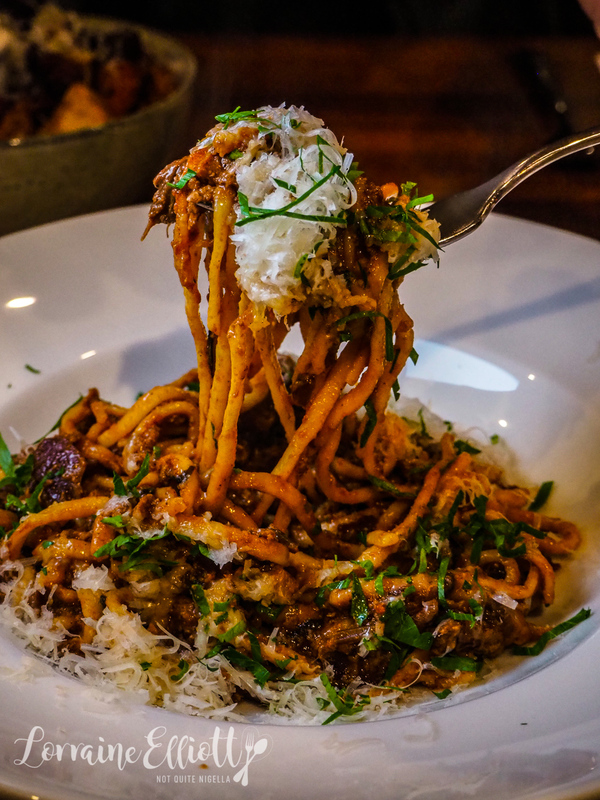 Our mains arrive and the house made linguine has a good amount of duck and porcini ragu layered throughout the silky pasta. It's very much like home style food where things are generously portioned. David pairs this dish with The Great Ron, named after his late father Ron. Incredibly, Ron passed away 1 hour after they finished picking the 2017 shiraz grapes. 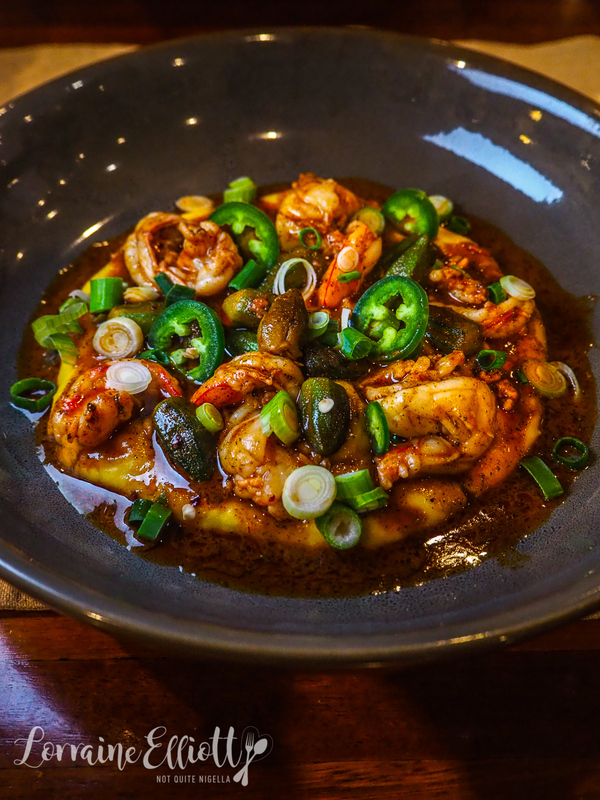 The brown butter prawns sit on a bed of saffron white corn polenta, fried okra and slices of fresh jalapeno. There is a lovely combination of aromas from the browned butter and saffron going on here. 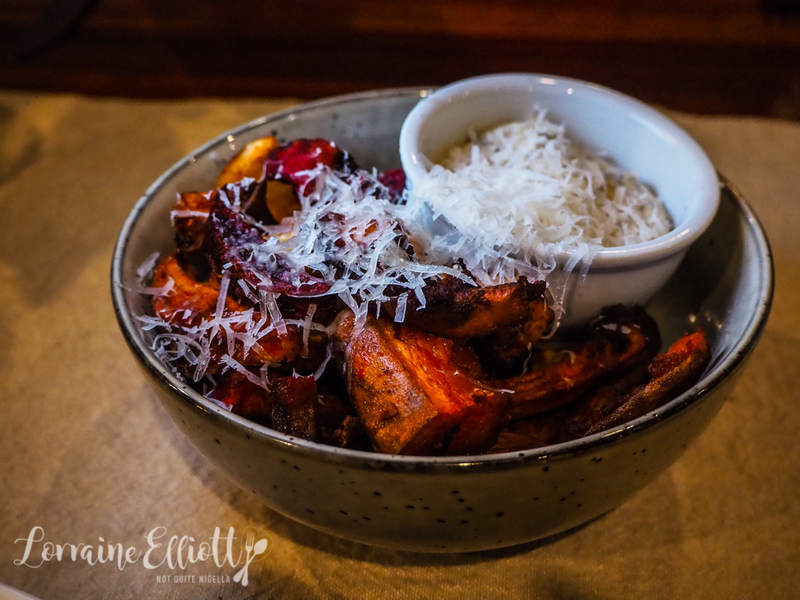 The fries are beetroot, sweet potato and potato fries served with grated parmesan and truffle aioli. I have to ask Mr NQN to take these away from me they're so tasty (and I somehow convince myself that they're healthy). There are four desserts including a cheese plate. The local pear pie comes out. 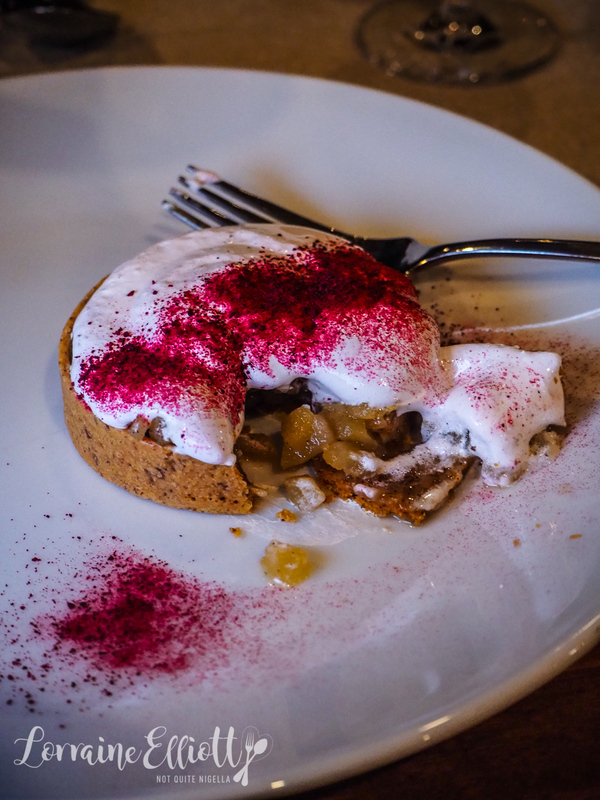 It's a warm almond tart crust with plenty of finely diced pear hiding under a blanket of meringue dusted with Davidson Plum that really mellows the sourness of the native plum. 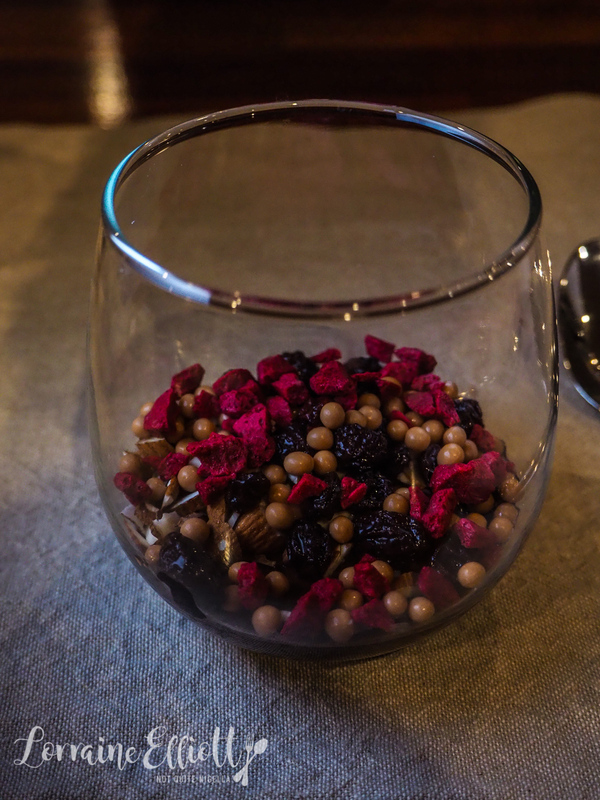 I adore crunchy textures especially with desserts and this chocolate pot is topped with drunken raisins and salted caramel crisp balls as well as rubied chocolate rocks. Our last dessert is one strong in anise. 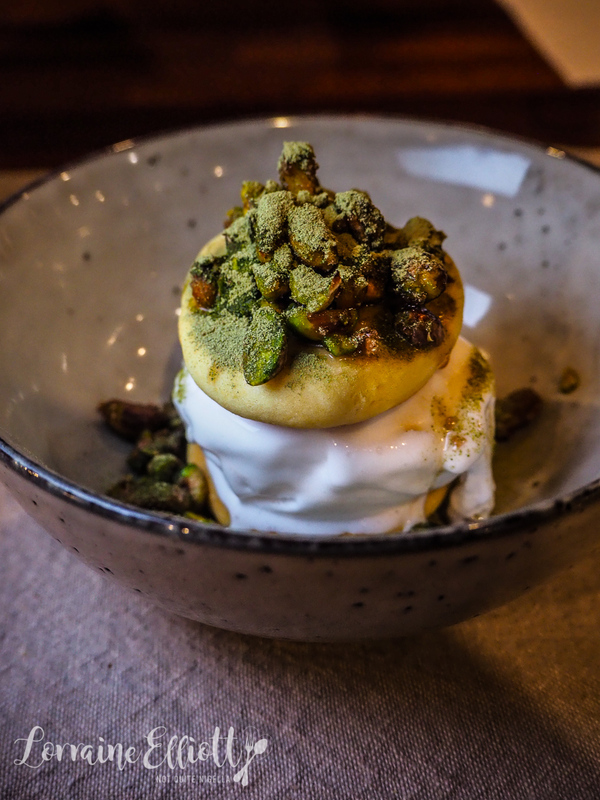 It's a vegan ice cream sandwich made with vegan shortbread, filled with smooth coconut ice cream and there's a pistachio glaze and finely ground aniseed myrtle and a pistachio glaze on top. 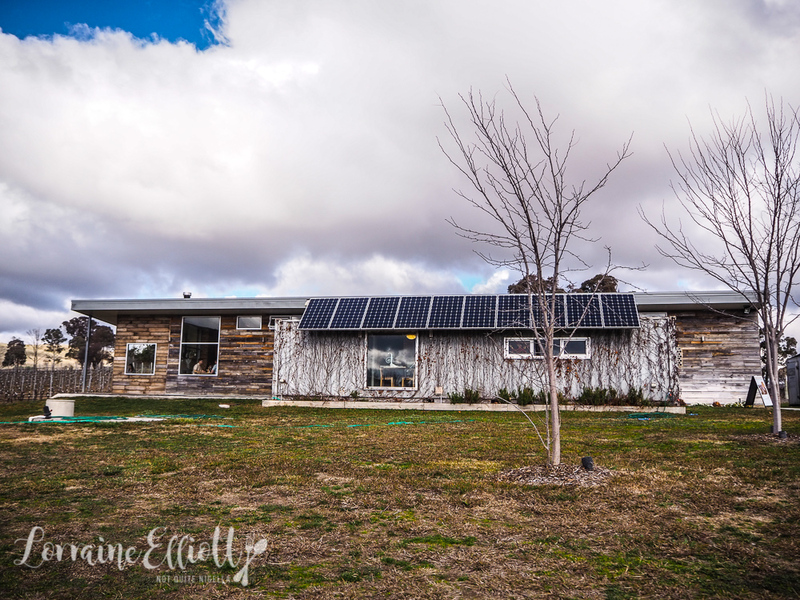 Our home for our stay in Murrumbateman is Abode, a new accommodation. 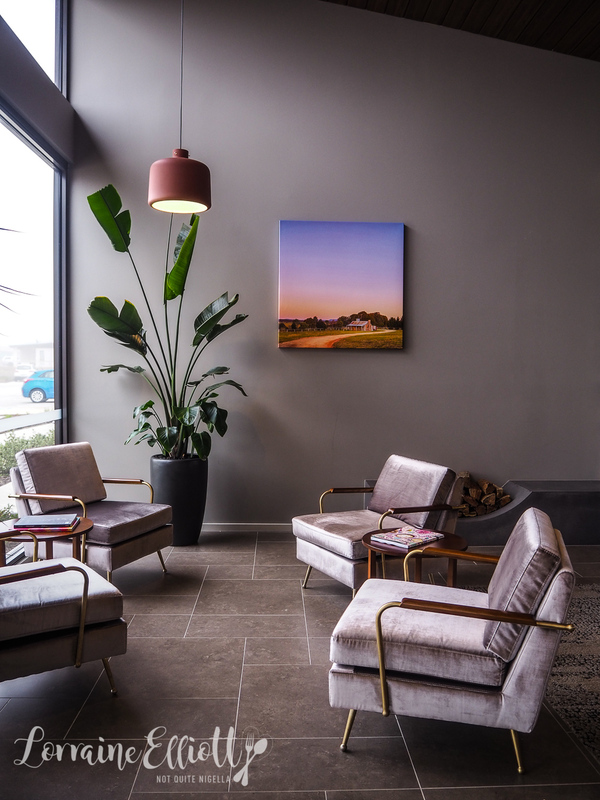 It's simple, new and clean and it's perhaps more like a new motel than a hotel and it is very reasonably priced. The staff are lovely and the rooms are warm and the beds comfortable and there's a "pantry" aka lobby shop selling local produce. Breakfast the next morning is at Olleyville at Shaw Vineyard. 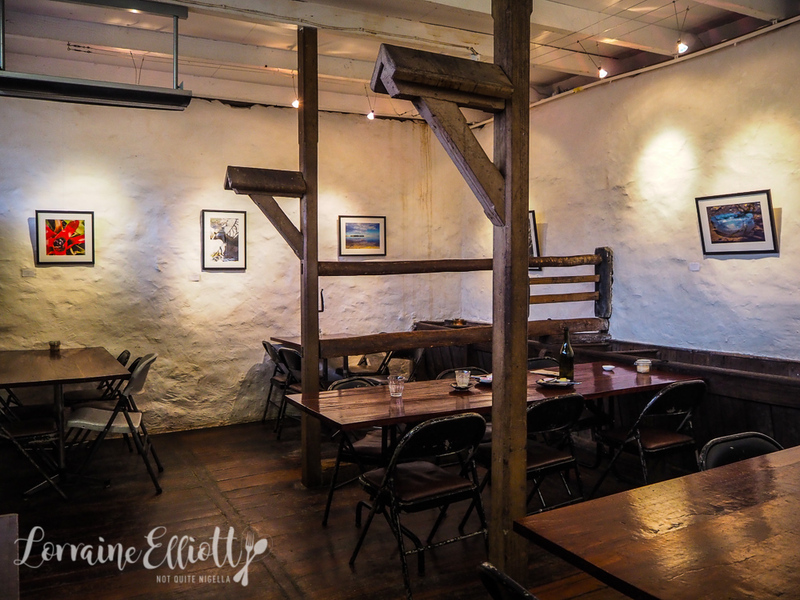 It's an enormous restaurant and the heart of this is the wood fired oven. The food does take a bit of time to arrive so just bear this in mind if you arrive very hungry. We're being slightly greedy but it's cold this morning. We order three items from the wood fired oven. 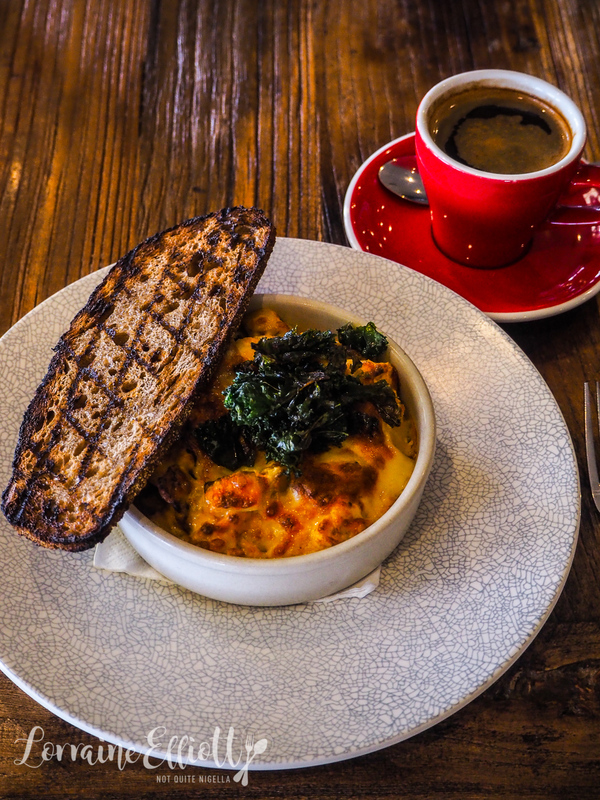 The first is a chorizo, roasted capsicum, potato, crispy kale on top and a slice of charred sourdough. I think I was expecting this to be more cheesy but the breakfast calzone is more like scrambled eggs and ham. There's smoked leg ham, baby spinach, scrambled egg and mozzarella wrapped in house made pizza dough. 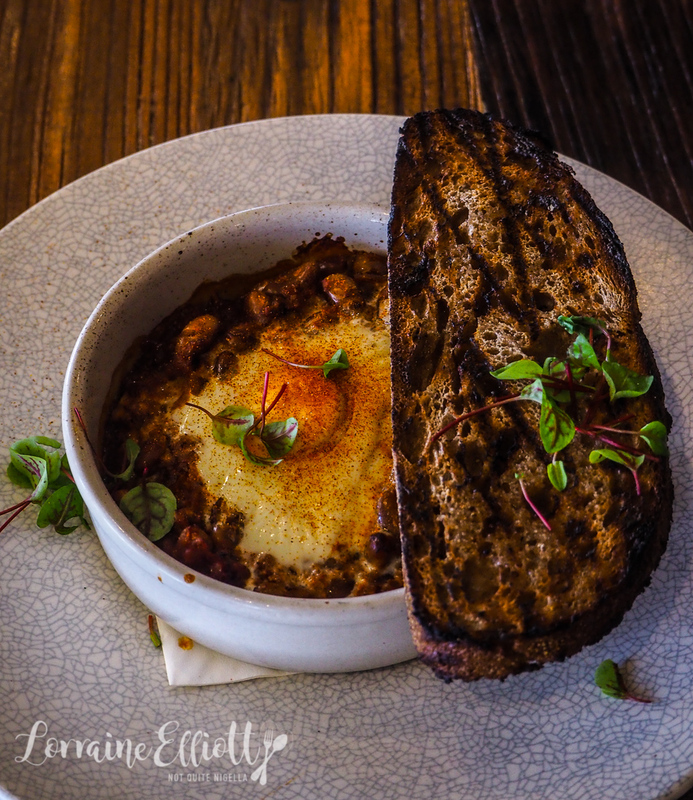 The last item are wood fired baked beans served in a ramekin. On top there is a runny egg, chilli dust & toasted sourdough on the side. The chilli dust adds a satisfying amount of flavour and spice to this dish. We are spending the rest of the day making the most of the wineries. 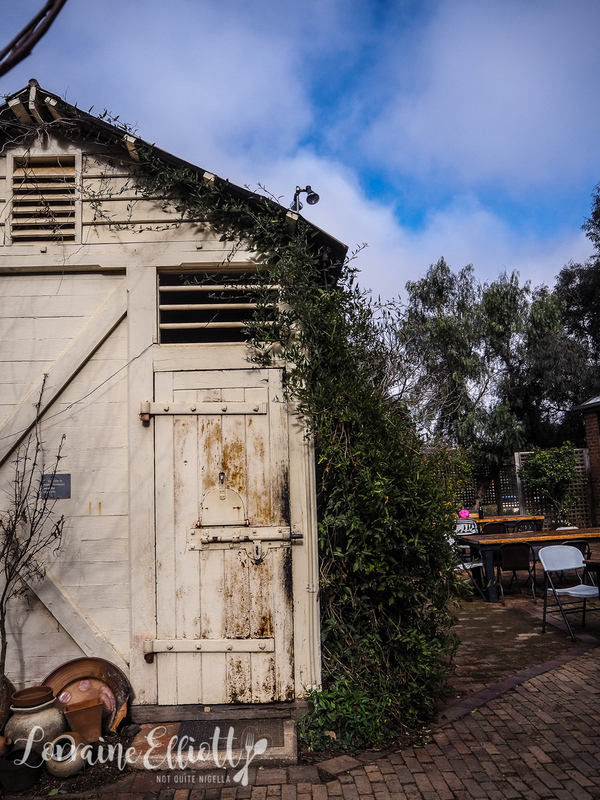 At Eden Road, there is a new winemaker making her distinct mark on the wines. 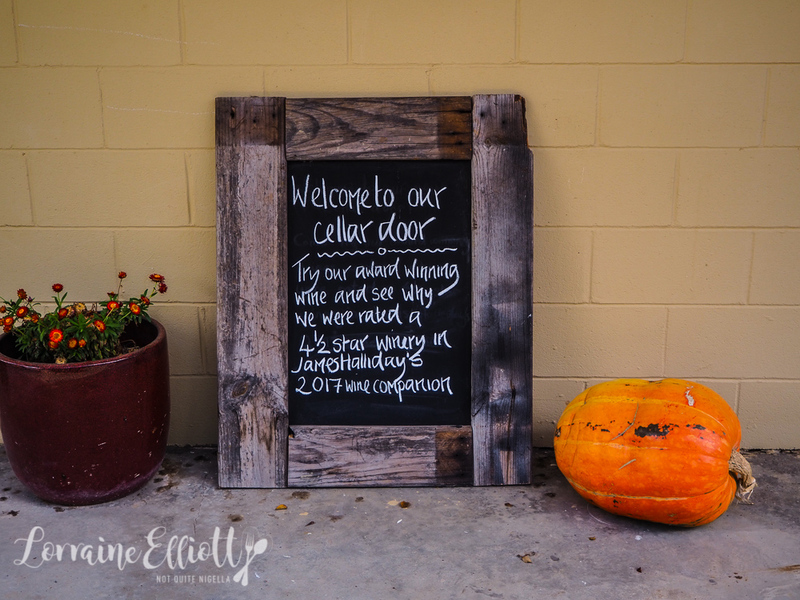 Celine Rousseau has been at Eden Road for 12 months now and the 2017 wines are made in her style. 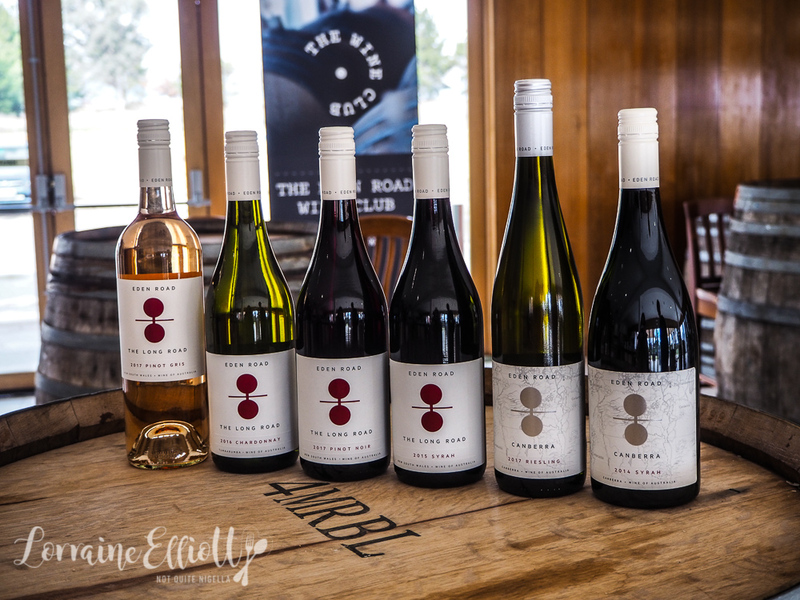 The blush coloured Pinot Gris made using grapes from Canberra and Hilltops is their best seller. With a distinct look the wine is smooth and easy to drink. The wines bottled under Long Road tend to be food friendly wines that are softer and provide easier drinking. 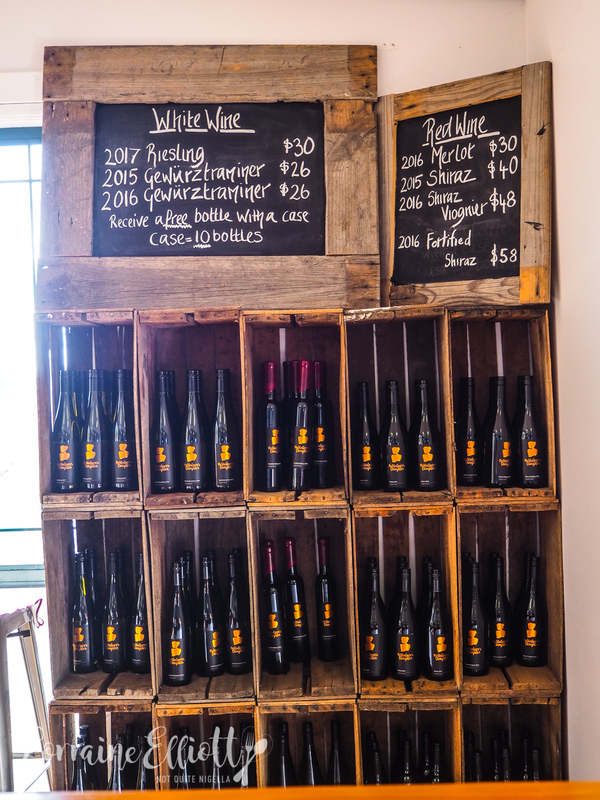 The 2017 Riesling is also a stand out with estate fruit and is a good balance of dry and residual sugar. 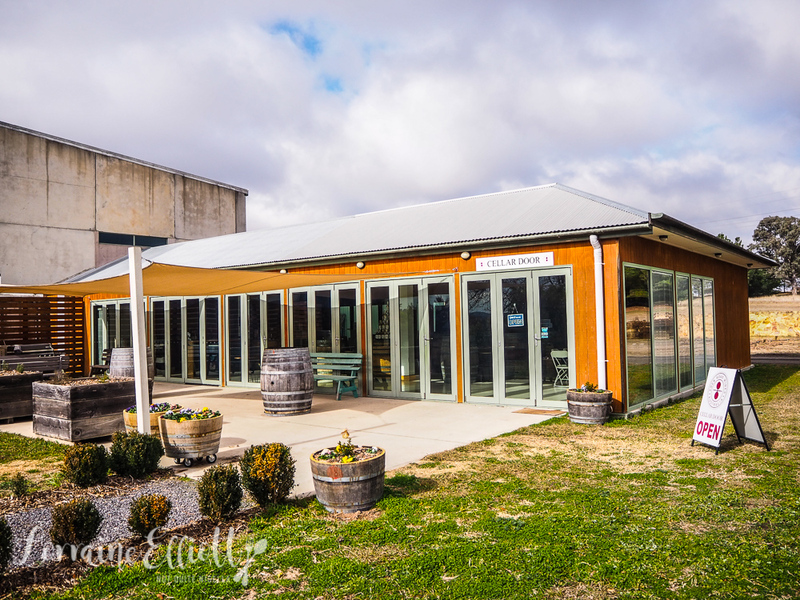 The Tumbarumba Chardonnay is also immensely drinkable and the main areas they grow fruit in are Hilltops, Gundagai, Tumbarumba and Canberra in one of the oldest established vineyards in the area from 1973. And why the label? Well some think that it looks like two grapes, others a person, but to them, everyone has their own road to Eden (theirs is one with great wine). And on the road to Eden you pass the tree of life and the tree of knowledge and that is signified by the motif. 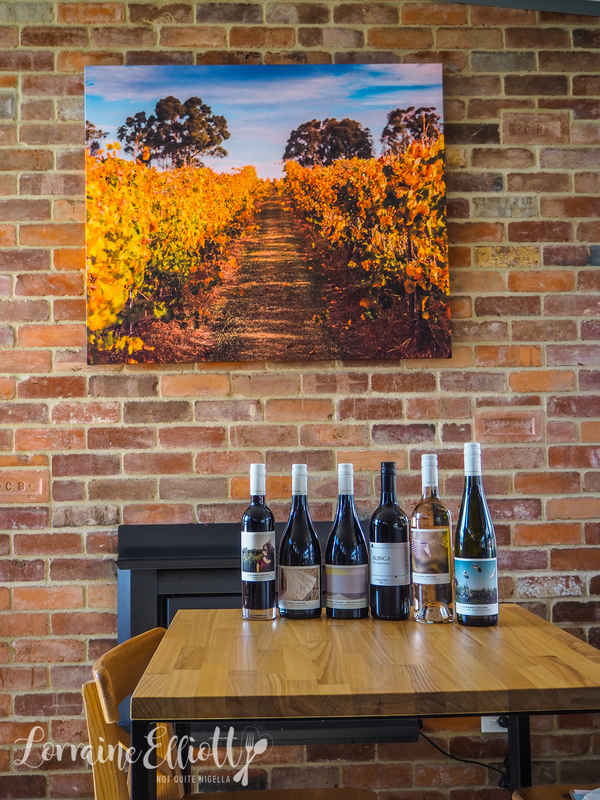 A short drive away is Four Winds Vineyard, a very, very popular spot for lunch and wine tasting. They are an inter generational family business with two generations represented. Sarah and John Collingwood own the winery along with her parents Suzanne and Graeme Lunney. The wine makers are Sarah's sister and brother in law Jaime and Bill Crowe. 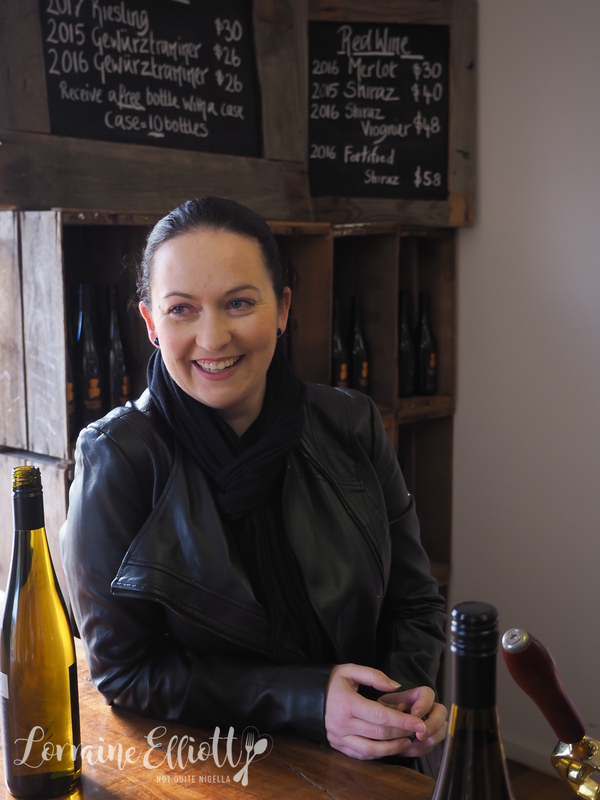 Sarah won a recent Australian Women in Wine Award. We arrive just before the main crowd hits and a tip, if you're coming here for lunch you definitely want to reserve a table if you want to sit inside. We start our visit with a tasting with the delightful Kylie. She pours a glass of their best seller, a Riesling that was designed to pair well with Thai food. Their wines are also designed to be softer and more food accessible. Next she pours a Sangiovese Rosé-this goes well with salty foods like a cheese board or prosciutto. The Sangiovese Red goes well with pizza. We also try the Alinga Cabernet Merlot, one of the numbers made by Sarah's father Graeme who is busy tending to the pizza oven outside. This was made using a small amount of fruit but it's a great wine. There is also Tom's Block, a Shiraz named after Sarah's brother who passed away. And for something sweet there's a fortified Shiraz with 19% alcohol. We take a seat by the fireplace as they throw another log onto it to keep everyone toasty. The winds have picked up and blown in with them about 40 people who have lined up for tasting or pizza. The menu is simple: six types of pizzas and drinks and a help yourself cheese and charcuterie board. You grab a board and choose the cheese, charcuterie and crackers you want and they give you a knife and you lay it out and nibble away. 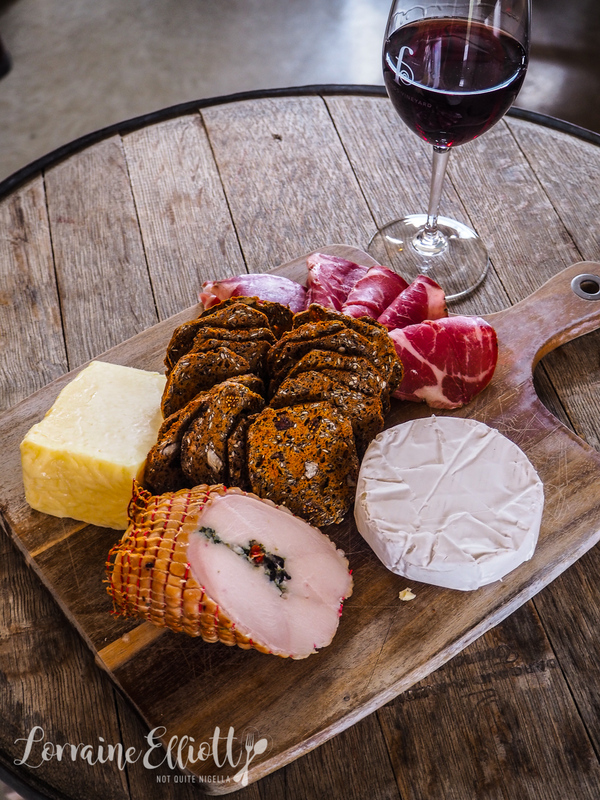 I choose some coppa, Poacher's Pantry smoked chicken, vintage cheddar, a creamy brie from Nowra and some fig and pecan crackers. Our pizzas arrive and we accompany them with a glass of Sangiovese. They are simple pizzas with a generous amount of tomato. 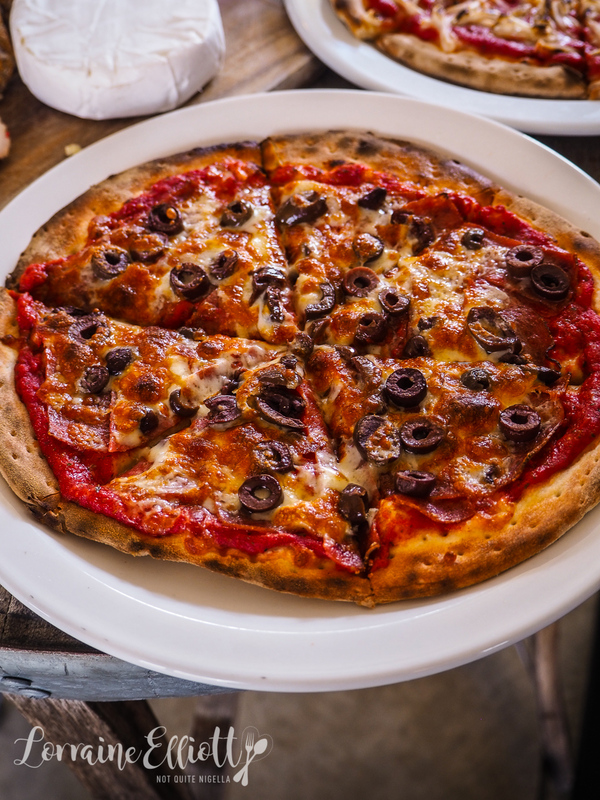 The first is topped with salami, mozzarella and black olives. They also do gluten free bases and vegan cheese and we couldn't resist trying the vegan cheese margarita. 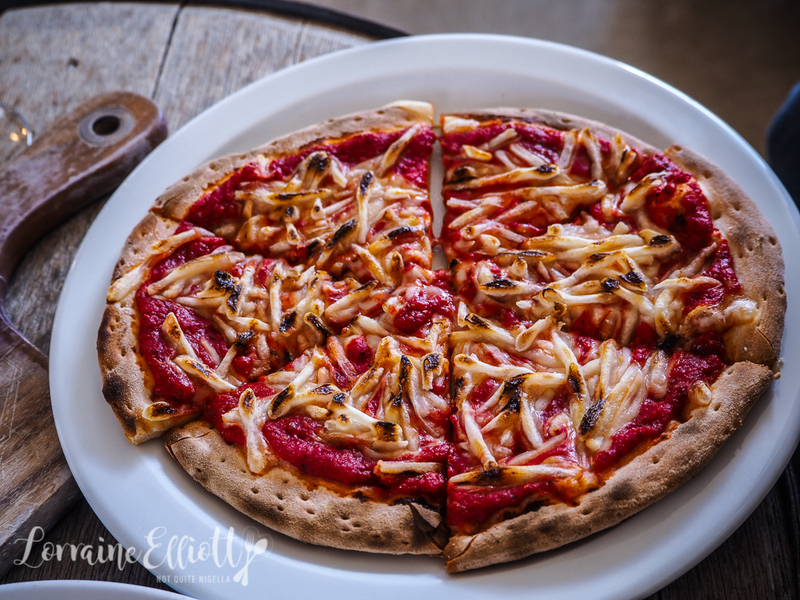 While some basil would have been nice it's actually quite a nice pizza-the vegan cheese is made using coconut! Dinner this evening is a real treat. 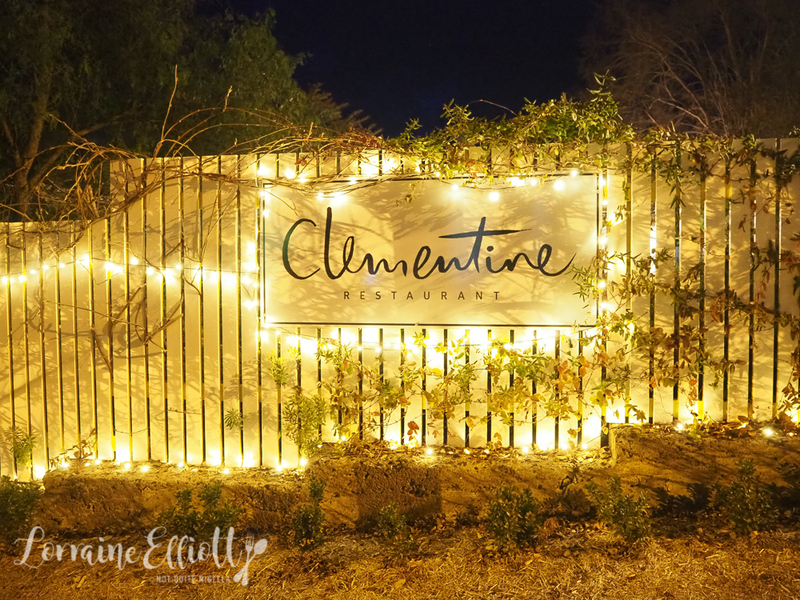 Clementine in Yass is a restaurant housed in a charming 1950's weatherboard cottage. Chef and owner Adam Bantock is in the kitchen tonight. 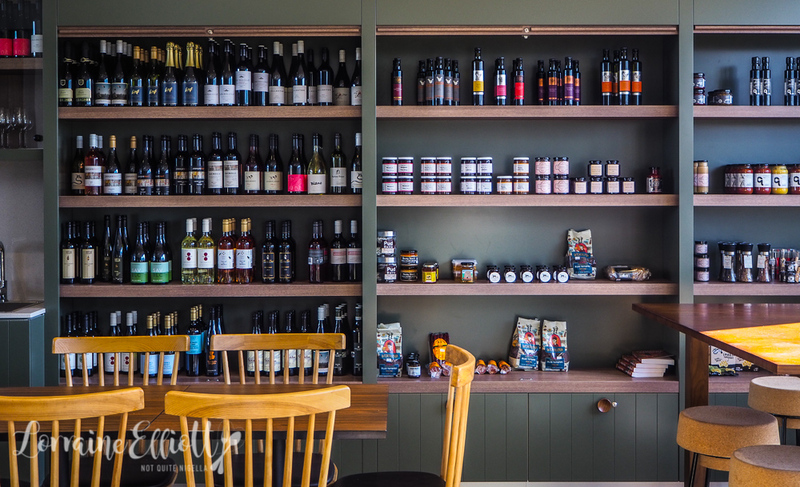 There's a little section with jams and preserves and the house made sourdough and the restaurant is open for lunch and dinner from Friday to Sunday. Service is friendly and they give us their recommendations when we ask. 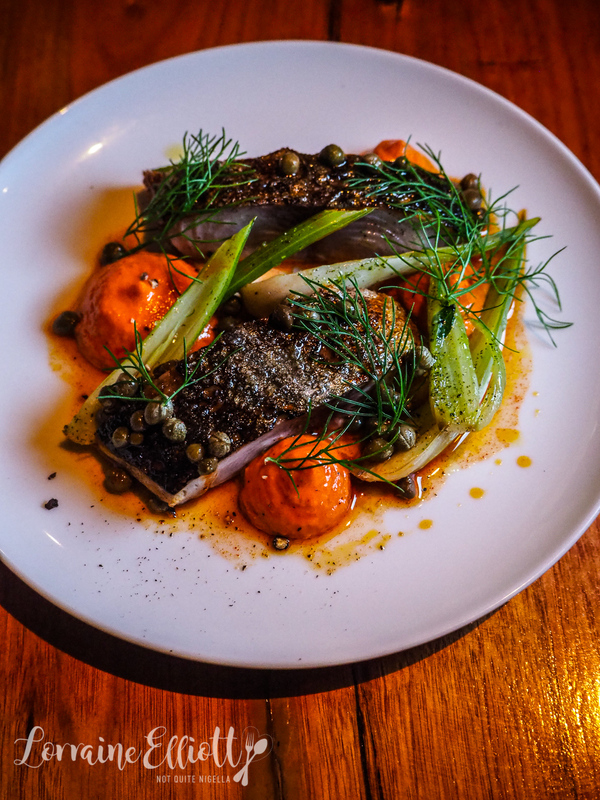 We start with the seared bonito, two fillets with romesco sauce, slender baby fennel, baby capers and paprika. This is a wonderful dish with a beautifully textured bonito fish. The romesco gives a little bit of sweetness from the peppers to balance the fish itself as well as the capers. I was in the mood for pasta as it was a cold Winter's evening so we go for the tortellini. 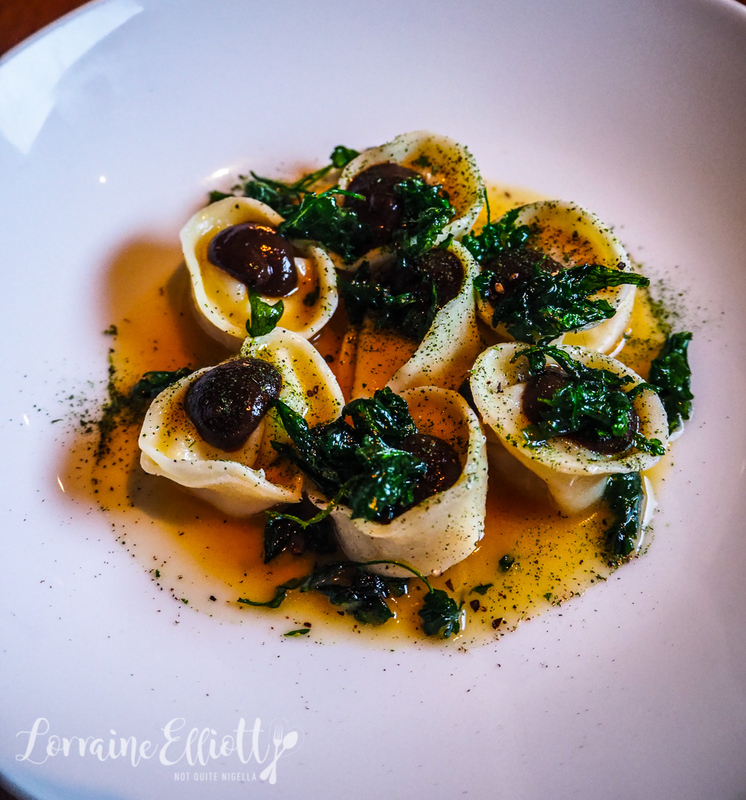 There are seven little parcels of tortellini filled with salt cod and mashed potato. On top there is a black garlic emulsion and it sits in a lemon browned butter. I scoop up the sauce with a spoon and then dip the house made bread into it. Now the cassoulet was ordered more for me than for Mr NQN who normally finds it too rich. 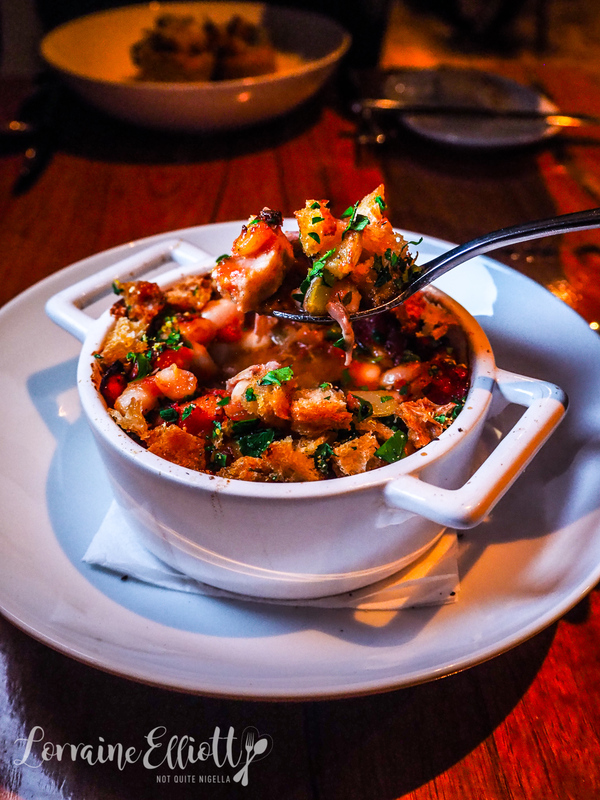 But this version balances the innate richness of a duck confit, sausage and bean cassoulet without being too heavy. It's one of the best ones I've had and it is topped with sourdough croutons. It even converts Mr NQN as he dips a spoon in and murmurs his appreciation for it. I don't often see crespelle on the menu so I had to order it. 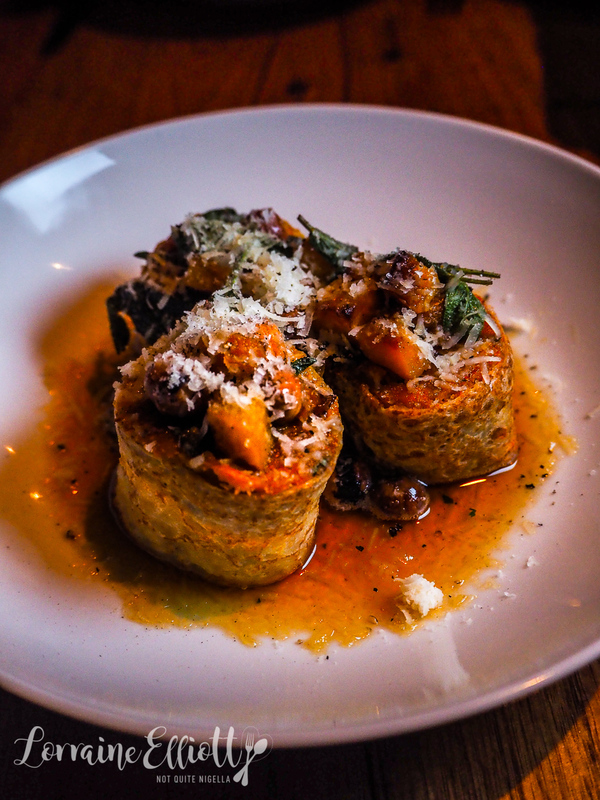 It's a crepe filled with pumpkin and ricotta and then rolled up and sliced. It is served with a burnt butter, sage, roasted hazelnuts and parmesan and is such a winter friendly dish that I want to replicate at home. As soon as they set this down my nose twitches agreeably. It smells like Christmas gingerbread or spice cake. 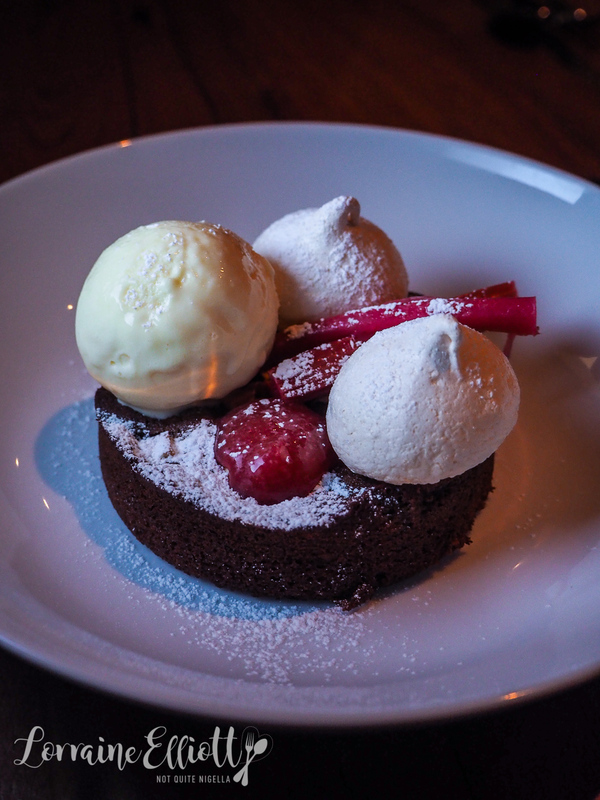 It's a gingerbread sponge with apple and rhubarb with a scoop of ginger ice cream and meringue baubles. 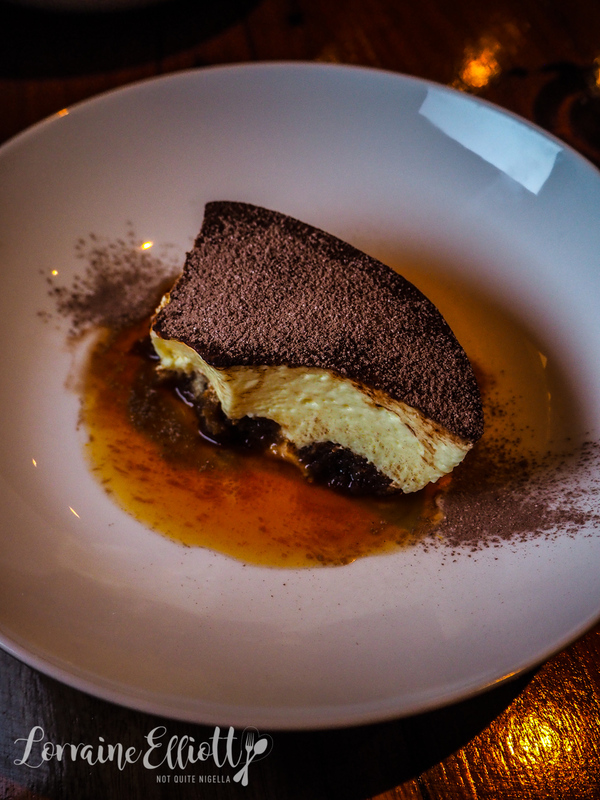 The tiramisu is a glorious number with a thick head of mascarpone and a base of espresso dipped sponge fingers. It is served with an orange caramel and a blanket of cocoa. The next morning, I rise and look at the temperature. Gulp. -1°C. Luckily we are headed to Cork Street Cafe in Gundaroo for breakfast. The drive is misty and foggy but the road to Gundaroo are quiet. 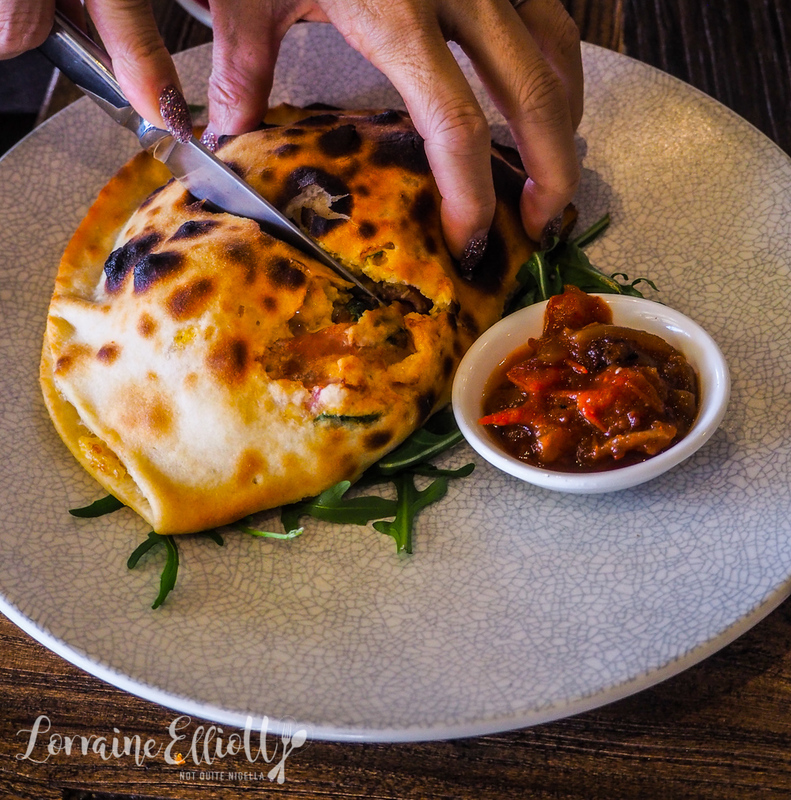 Normally Cork Street Cafe is known for their pizzas but they are also open for breakfast on the weekends. It's a gallery cafe that sits where the old mounted police horse stables used to. If you venture into the furthest room you can see the old troughs. It's warm and welcoming here from the all female team. Service is friendly and prompt and they tell us that all the breads are made in house. I sip on my mug of freshly brewed Tea Craft chai latte while looking at the food menu. Prices are very reasonable. 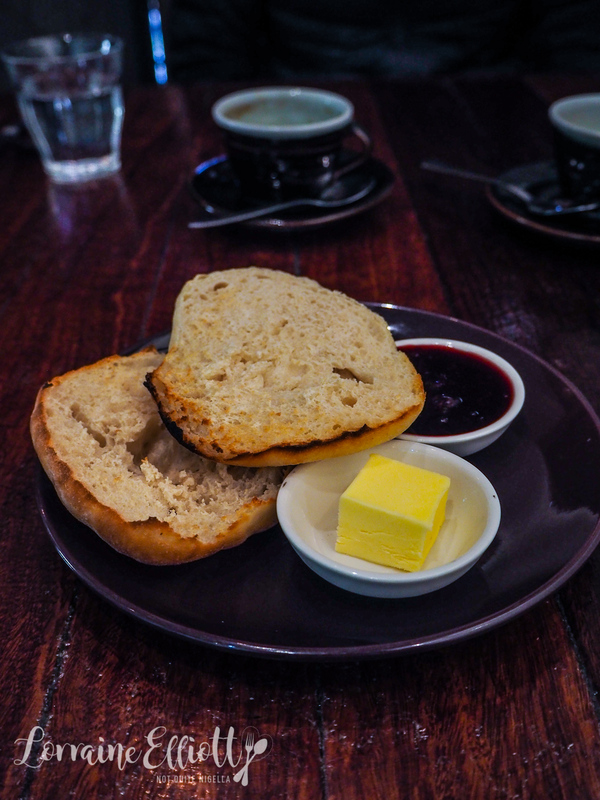 I am definitely carb loading and having watched the temperature rise to a mere 4 degrees, what can I say but I buried myself in bread starting with a lightly toasted mini focaccia bread with black plum jam and butter. 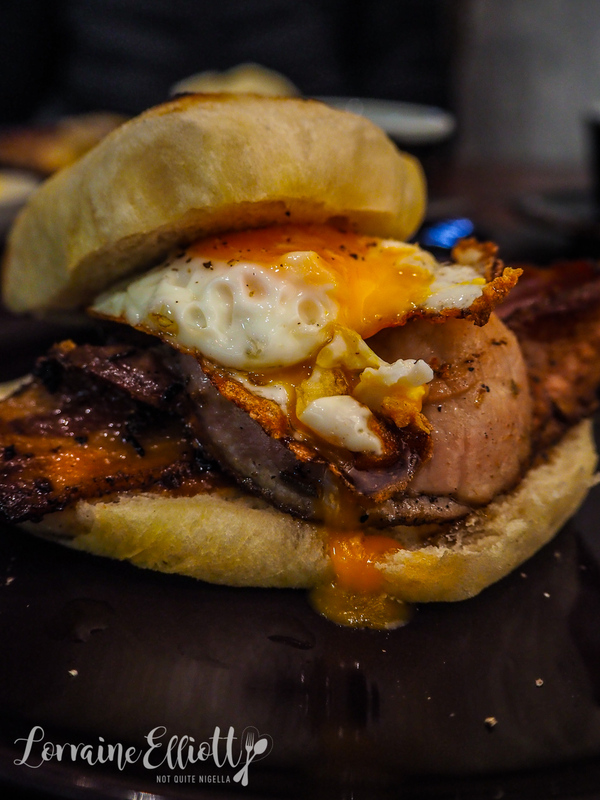 The same focaccia bread is cut in half and stuffed with Poacher's Pantry bacon, a fried egg and tomato relish. It's got just the right amount of filling to fresh toasted bread. And yes I demolished my half and then some. Mr NQN loves sweet breakfasts so this was more for him but of course being me I dive right in murmuring about how good it is. 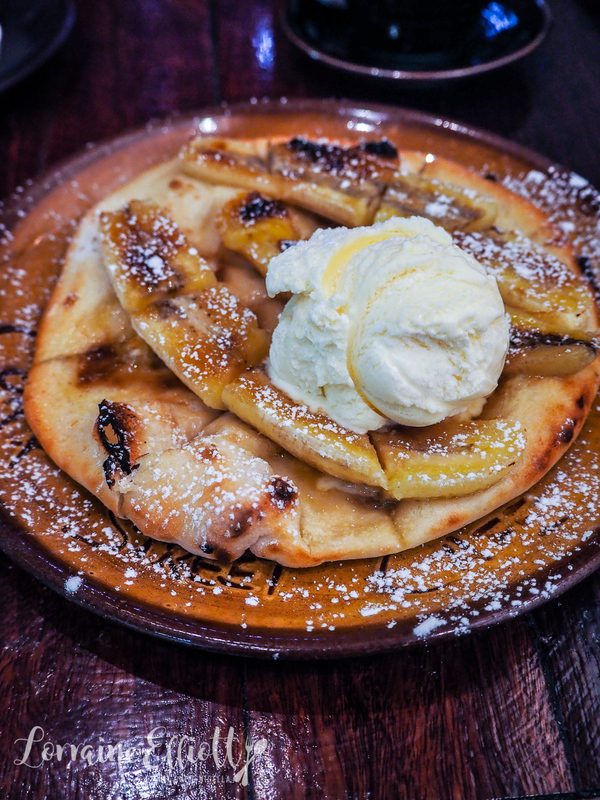 The flat bread is like a slightly puffy pizza dough with caramelised banana and a scoop of vanilla ice cream. Only good can come from this combination and I slide his half over to him. Ice cream in 4 degree weather? Yes please! By the time we've finished breakfast the pizza menu has started so we feel like we should try a pizza (in the name of research darlings!). 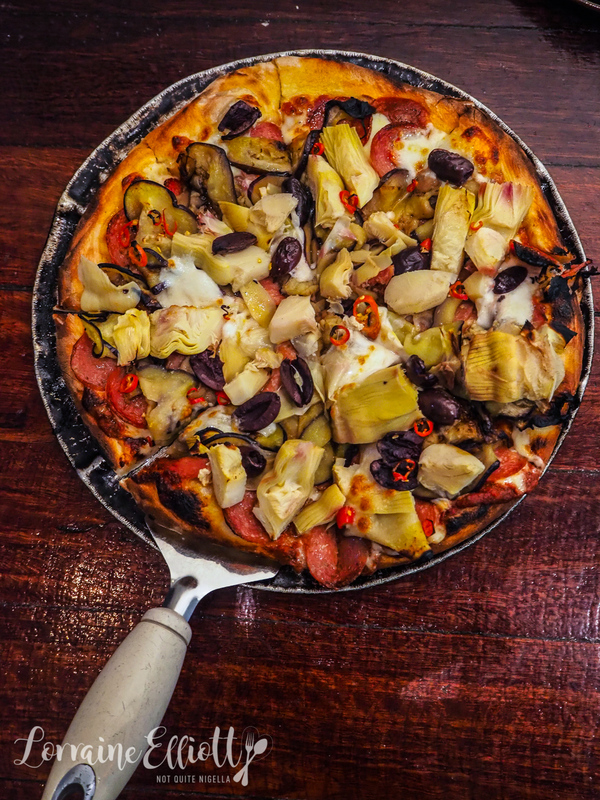 The pizza menu is large and I go for the Sophia with pepperoni, roasted eggplant, artichoke, bocconcini, olive and chilli. I ask for extra chilli. This is a nice pizza with a lovely crispy base and a nice balance of meat and vegetable toppings. We can't finish it so we box the remaining half up and it also makes a nice snack on the three hour drive home! So tell me Dear Reader, which meal appealed to you the most? And do you feel that more women are coming to the forefront nowadays in your industry? travelLions, Tigers and Bears at Jamala Wildlife Lodge, Canberra! 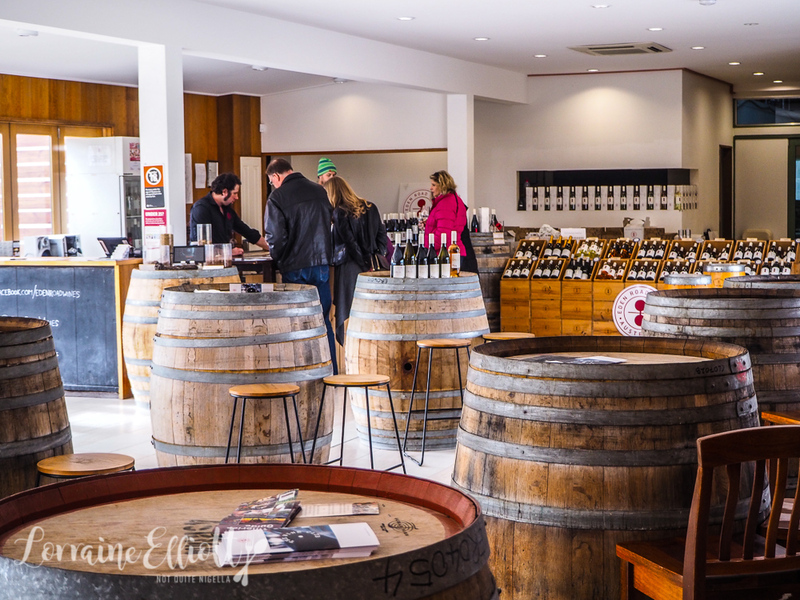 travelCanberra Shakes Things Up With 14 Fun Things To Do in The Capital! 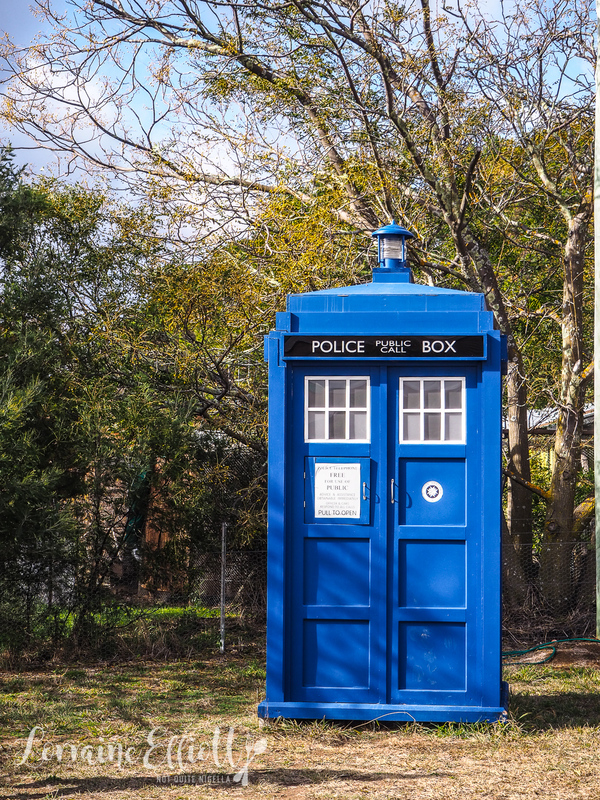 travelStaying in Canberra? Check Into These 4 Canberra Hotels With 4 Different Personalities! travel Lions, Tigers and Bears at Jamala Wildlife Lodge, Canberra! 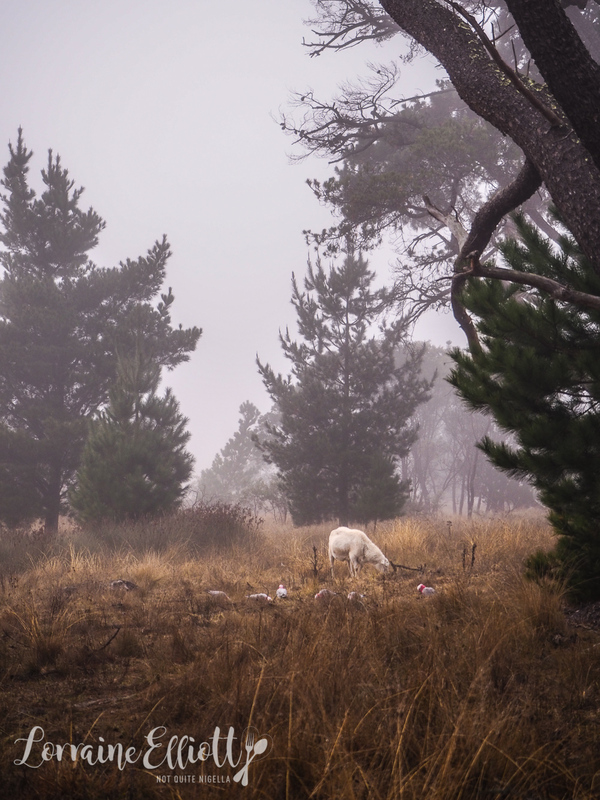 travel Canberra Shakes Things Up With 14 Fun Things To Do in The Capital! travel Staying in Canberra? Check Into These 4 Canberra Hotels With 4 Different Personalities!